Good for live use, but not so good in a home studio, this is nevertheless an impressive substitute for an amp´s spring reverb circuit. Quality spring reverb emulation. Great with an expression pedal. Grainy tone not great for serious studio use. Launched in 2006, Marshall's current pedals reiterate that the race is on to see just how many functions can be crammed into a single stompbox. 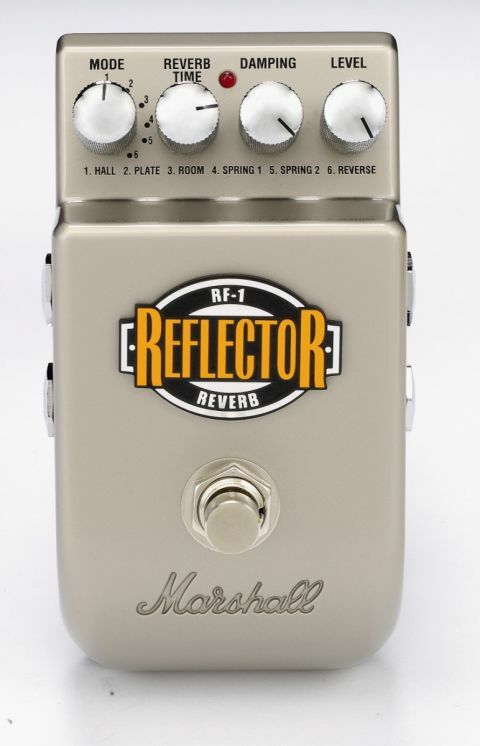 This RF-1 Reflector reverb, and its sibling pedals the RG-1 modulator and EH-1 echo, pack six individual voices each. Marshall's redesigns means the metal footswitches are now a little larger and more confidence inspiring than those initially featured on their pedals, but otherwise the housings are virtually identical. The units themselves feel weighty and hard-wearing, and we still think that the battery access panel that can be opened with a coin is a great idea. Even if you haven't got a screwdriver mid-gig, somebody will always have a coin. Considering what an integral effect reverb has been to the electric guitar over the years, there are a surprisingly small number of dedicated reverb pedals on the market. Most of you will own, or have owned, an amplifier with a spring reverb circuit, but many players who use old-school single channel valve heads may need a standalone pedal like this. The RF-1's reverb time, damping and level controls allow you to shape and equalise the virtual space, while a six-mode selector allows you to choose from hall, plate, room, two spring voicings and reverse-reverb sounds. The pedal's twin outputs operate in a similar way to sister pedal the EH-1 Echohead, with 'spill over' obtained from output two in mono only. Instead of the option of a tap tempo control, this time an expression pedal can be connected to increase or decrease the reverb time on the fly. Switching to the Reflector, many players' first port of call will inevitably be to see whether the unit provides an authentic-sounding replacement for an amplifier's onboard spring reverb. Happily, both spring modes are suitably splashy, and the damping control allows you to roll off or add top-end sheen to the sound as per your requirements. The other reverb voices are more idiosyncratic, but all are musical and useful in their own right. The addition of an expression pedal, meanwhile, allows for lovely reverb swells that work particularly well with ghostly slide atmospherics. We noticed a slight graininess throughout the modes that works well with an electric guitar but, to our ears, may preclude the RF-1 from studio use with other instruments.